Researchers from MIT, UC Berkeley, Lawrence Berkeley, and King Abdulaziz City for Science and Technology published a paper in Science describing a solar-powered device that uses a new type of metal organic framework (MOF) to extract up to three litres of water per day from even the most arid desert air. UC Berkeley's Omar Yaghi invented MOFs ("porous crystals that form continuous 3D networks") in the 1990s, and more than 20,000 MOFs have been synthesized since; each one binds to a different type of gas. 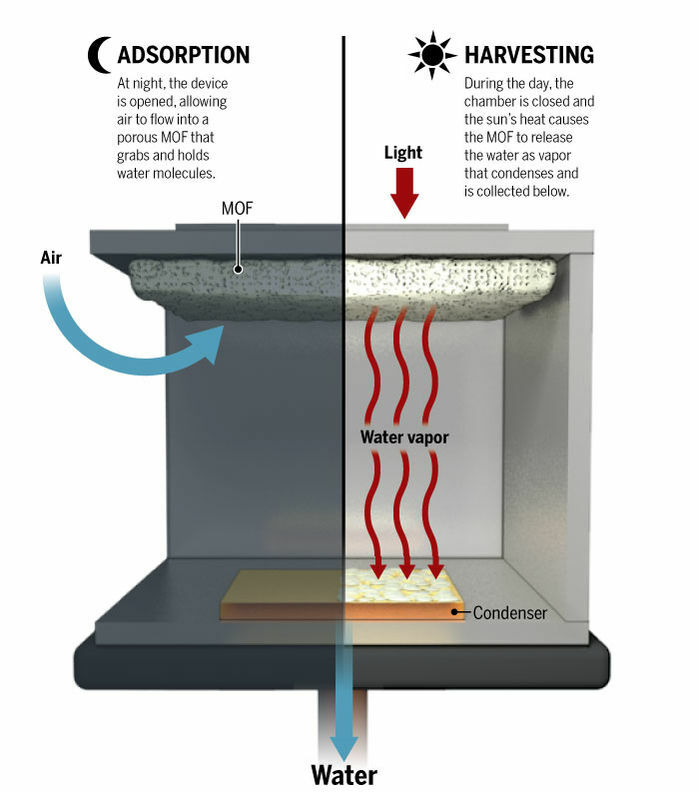 The zirconium-based MOF-801, introduced in the paper, binds to water vapor even in extreme low-humidity environments. Run continuously, it "pulls" 2.8l of water out of desert air per 24-hour cycle. At $150/kg, zirconium is too expensive to use for a mass-produced product intended to be distributed to people living in arid environments, but Yaghi proposes further work that would swap in aluminum, which costs 1% of the cost of zirconium.